A helicopter was used to move trees from state land to the AuSable River to create fish structure. Photo: Michigan DNR. The tree-lift was the last of a series of planned AuSable improvement projects that began in 2000 with the development of the AuSable Headwaters Restoration Project. The $2 million effort involved the creation of sand-traps on the AuSable River North and South Branch, modification of the Grayling Dam and restoring woody debris throughout the river system. “This was the last of our promise to anglers,” said Dave Borgeson, the Northern Lake Huron Unit supervisor for the Michigan Department of Natural Resources. “Now we will wait a year and a high-water cycle to see how these structures fare and then do a follow-up. 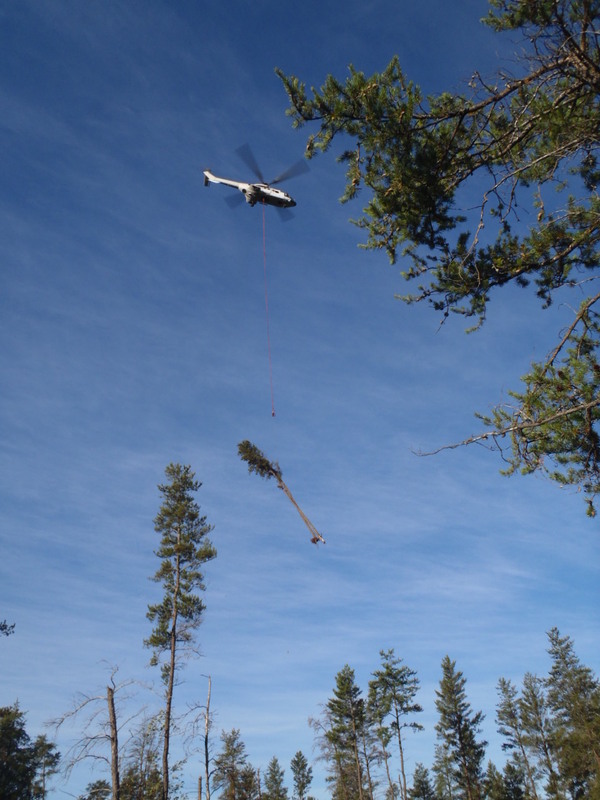 A total of 972 red pines, oaks and jack pines were lifted in by helicopter during the first week of September. They were flown in from timber management operations in the Au Sable State Forest and positioned on the river all along the Mason Tract and down to the confluence with the AuSable mainstream. The Mason Tract, which is split by the South Branch, is well-known for brook trout and brown trout fishing. It pulls anglers from all over the country who relish its wild character. The 4,493 acre property is named after the late George Mason, an industrialist who purchased 1500 acres as a private retreat in the 1930s. He later bequeathed the property to the state and its boundaries were enlarged – providing ready public access to 11-miles of prime trout fishing water. “It’s a gorgeous stretch of water,” said Bruce Pregler, president of Anglers of the AuSable. “And it is starting to look like what it was before the area got timbered. A 2010 DNR shocking survey conducted along 900 feet of the South Branch at Smith Bridge on the lower end of the river found 419 brown trout per acre, ranging from 2 to 20 inches long. The survey also recorded 505 brook trout per acre from 1 to 9 inches long. The findings were in keeping with those from other years, which sometimes ran higher and sometimes lower. The variability is due to a variety of changing natural conditions, according to Borgeson, but the long-term averages will be significant to watch. The new tree placements could bring about a change. The $2 million restoration project has involved moving nearly 10,000 trees to one or another of the AuSable River’s branches. Funding for the project came largely from the federal Sportfishing Restoration Act with funds from the state habitat improvement account. Nearly 10,000 trees dropped into the AuSable River since 2002. Here’s a quick look at how many and where. Mainstream: 3,403 trees / 320 locations. Glad to see it. I fished the Mason tract for the frist time this past Spring. Can’t wait to go back next year. mfs686: How did you do. It’s a great stretch of water. I’ve paddled it and fished it many times. Lots of little brook trout. Water level was high so the fish were scattered everywhere. Been a long time since I went fly fishing for trout. Saw some bigger fish but they wanted nothing to do with what I was offering them. I need to do a lot of tying this winter. Beautiful river and fun to fish. The challenge is finding the big fish. Hopefully this will not only boost numbers, but size also. I’ve been up there fishing the past two years in August. Next year I’ll have to do more night fishing in an effort to catch something bigger.